There is an ever-increasing demand for new and more sophisticated imaging probes for experimental research and clinical applications, especially with the escalation of molecular medicine approaches to therapy design. The center just recently completed the installation of the state of the art cyclotron/PET cGMP radiopharmacy. 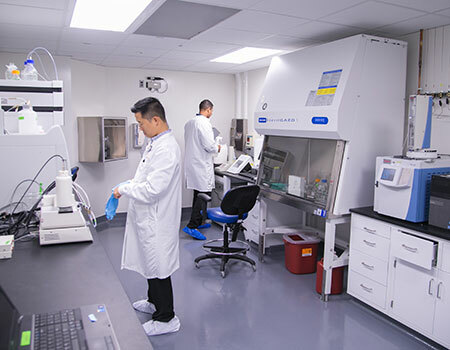 Our Cyclotron facility is located on a beautiful 79-acre Health Sciences Campus which is three miles northeast of downtown Los Angeles and seven miles from the USC University Park Campus. 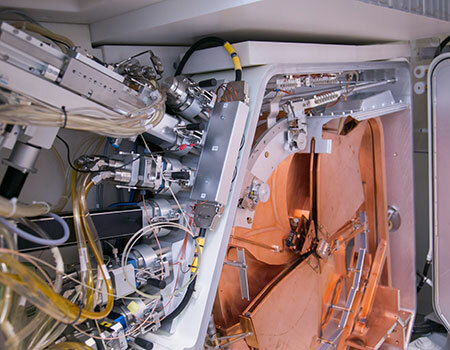 Here at Molecular Imaging Center we are operating a General Electric PETrace 860 cyclotron with 16 MeV protons and 8 MeV deuterons, 8 hot cells with remote manipulators, a gas chromatograph, automated HPLC systems, in-line UV and radioactivity detectors, radioactivity dose calibrators, balances, pH meters, rotoevaporators, automated synthesis modules (for [18F]FDG, [15O]H2O, [15O]CO, [15O]CO2, [13N]NH3, [11C]FMAU, [18F]FMAU, [18F]FHBG, [18F]Fallypride), and a lypholizer. 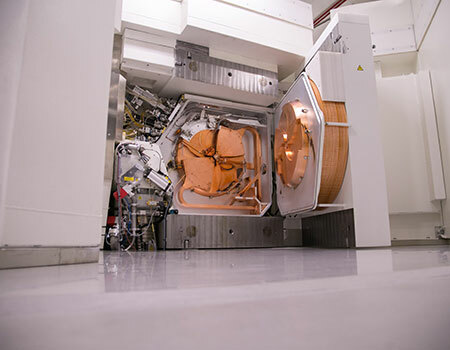 A cyclotron is a particle-accelerating device that allows for the production of onsite radiopharmaceuticals for studies using Positron Emission Tomography (PET) scans. A PET scan is a whole body imaging scan that allows doctors and researchers to view a patient’s internal organs at the cellular level. The availability of the cyclotron and cGMP radiopharmacy will provide USC investigators with these invaluable resources. The primary mission of this resource is to provide expertise in the design, synthesis, and production of radioactive or stable agents for imaging of various disease and research applications and make such agents available to USC investigators. Our vision is for the USC MIC to have a comprehensive radiopharmacy and chemistry program focused on the development of new radiotracers and non-radioactive biological probes for use in interdisciplinary biomedical research and clinical imaging. 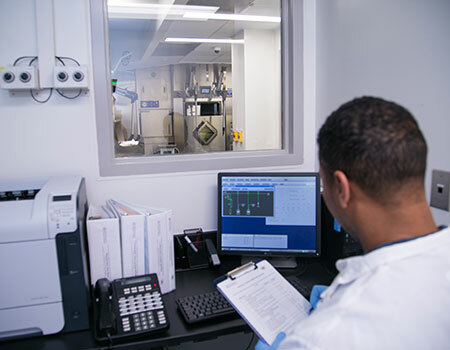 The radiopharmacy production laboratory is designed to adhere to GMP conditions as required by the U.S. Pharmacopeia Chapter 823 and 21CFR part 212. 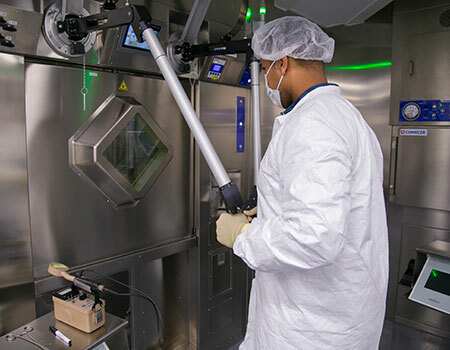 This includes validation of laminar flow hot cells for sterile processing of the radiopharmaceutical end product, and individual hot cells to contain the automated processing modules. These improvements allow us to efficiently and safely handle large amounts of radiopharmaceuticals. The improved quality control sections have dedicated instruments to test the final products before being released for human use (i.e. HPLCs, gas chromatographs, gamma spectrometer, pyrogen testing, sterility incubators, etc.). These capabilities provide a more efficient and safer environment to produce radiopharmaceutical products for clinical imaging program as well as support our ongoing research program. The Radiochemistry facility also houses multiple HPLC system with in-line UV and radiation detectors, electronic balance and microcentrifuge that support quantitative measurement of radioactive metabolites in blood and tissue samples.Molecular imaging research activities are supported by organic chemistry and biochemistry facilities located on the second floor of the Cancer Research Laboratory (CRL), nearby from the facility shown in Figure 17. This facility is currently utilized by chemists working on the development of novel MR contrast agents and fluorescence and bioluminescence probes for optical imaging studies. There are cell culture facilities as well as a general-purpose chemistry/biochemistry laboratory which houses biological laminar flow hoods, chemical fume hoods, cell incubators, an HPLC system, radiation dose calibrator, microcentrifuge, a -20 deg. C freezer (70 cu. ft.), a freezer/refrigerator (70 cu. ft.), a liquid scintillation counter, a cryostorage tank and computers for data acquisition and analysis.